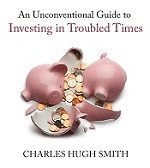 oftwominds-Charles Hugh Smith: Are Property Taxes a "Wealth Tax" on the (Mostly) Non-Wealthy? Are Property Taxes a "Wealth Tax" on the (Mostly) Non-Wealthy? You are correct that property taxes are an oft-forgotten cost of homeownership that many buyers fail to properly evaluate when determining how much house they can afford over the long term. Perhaps a better way to view property taxes is as an inefficient proxy for income taxes -- state and local governments assuming that people who can afford a home of a certain value, must have sufficient income to pay ad valorem taxes and per foot and per parcel charges at a given rate. In a volatile economy, that assumption is often invalid. When the Fed runs out of monetary games to play, and asset values across the economy normalize, both state and local governments and homeowners will all be in a pinch -- governments because the valuation-based portion of the tax base will crash, and homeowners because the fixed charges will no longer fit within their diminished incomes. This is already occurring in suburban Chicago, where annual property taxes can approach 10% (!) of property values. Thank you, Ann M. ($50), for your splendidly generous contribution to this site -- I am greatly honored by your steadfast support and readership. Thank you, Tim B. ($40), for your magnificently generous contribution to this site -- I am greatly honored by your steadfast support and readership.